H2 Designs: The Paper Players Challenge #107 - Back to School Rules with a Die-Cut Apple! 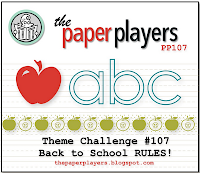 The Paper Players Challenge #107 - Back to School Rules with a Die-Cut Apple! The bottom curved edge of the apple was cut by hand. To disguise the crease lines in my apple shape, I've embossed it with the lattice embossing folder, & used just a "touch" of sponging, lol! I traced around my embossed apple to get the shape for my actual card. The leaf was punched from the blossom petals builder punch & the stem was made from the round tab punch. The stem was sandwiched in between the embossed layer of the apple & the actual card. A layered tag, attached with cherry baker's twine completes the project. I think it kinda looks like one of those straight sided Jonathon Apples - yum!